Utah protest defends DACA, demands legalization for all | Fight Back! Salt Lake City, UT — Over 100 people joined Students for a Democratic Society (SDS) to protest Donald Trump’s repeal of Deferred Action for Childhood Arrivals (DACA) Sept. 15, at the Wallace F. Bennett Federal Building downtown. Griseille Davila, a DACA recipient and SDS member, gave an impassioned call to unite as a community. Davila called on the crowd to fight for immigrant rights and to defend undocumented immigrants from incarceration and deportation. Sara Kang, another SDSer, began to cry while addressing the crowd, saying that she was worried for her friends who may face deportation. Kang finished her speech urging those assembled to fight back against the racist attacks from the Trump administration. Emmaly Anderson, also with SDS, called out the hypocrisy of the University of Utah which has claimed to support undocumented students. Anderson said the U of U refused to meet student demands. She also said the U of U needs to refuse to host the on-campus event for Ben Shapiro, a racist right-wing columnist who has called for completely closing the U.S.-Mexico border. 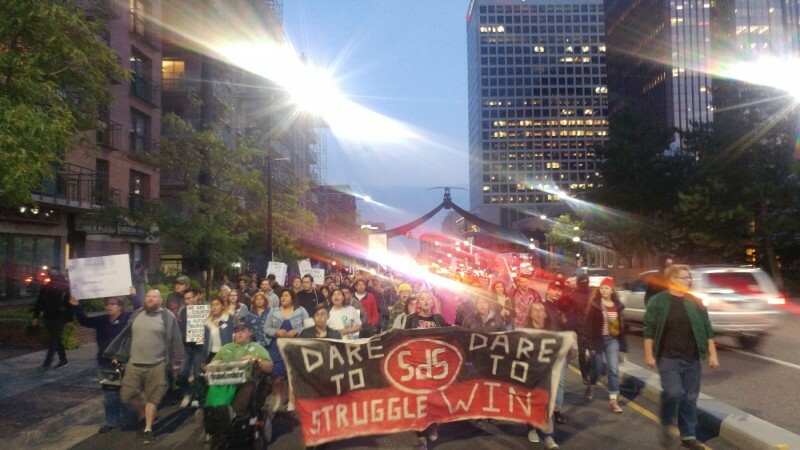 Besides SDS, the Sept. 15 protest drew organizers and activists from the Freedom Road Socialist Organization (FRSO), Utah Against Police Brutality (UAPB), and People’s Power Assembly as well as community members and students from the University of Utah.